Last week in Sunday School, I taught my students the story of Balaam’s donkey. In this story, the king of Moab asked Balaam to curse God’s people. As a prophet of God, it would not have been a good thing for Balaam to have cursed God’s own people, but the king was offering a fat paycheck for Balaam’s service. Balaam knows it is the wrong thing to do, but he sets off with his trusty donkey to talk to the king, and the assumption is that he intends to take the money and curse God’s people. As Balaam was traveling to see the king about this request, and God sent an angel who stood in the roadway, scaring the wits out of poor Balaam’s donkey. The donkey first walked off the road, then lay down in the middle of the road– wanting to do anything but cross the angel standing in the path. Balaam couldn’t see the angel, didn’t understand the donkey’s behavior, and responded by beating the poor animal. He basically threw a hissy fit because his plans were being changed and he didn’t want to adapt. The story ends with the donkey receiving the gift of speech, so he could explain his behavior, and Balaam’s eyes were opened to see the angel standing in their path. Balaam realizes that he was on the path to sure destruction, and his donkey’s behavior was protecting him. The lesson, I explained to my class, was that sometimes our plans are blocked by situations we don’t understand, and sometimes it is God blocking our path to keep us in His path and not on our own path. I thought about this story as I prepared for hosting Thanksgiving this week. This year, for the only the second time ever, I hosted Thanksgiving. Originally I was not pleased to have my traditional Thanksgiving changed. But it turned out to be very nice. Thanksgiving is about more than just the food. It is about family and getting together. It is about life and love and surviving another year and being thankful for everything that happened in that year. Normally, my family’s Thanksgiving is loud and messy. We gather at my parents’ house — 3 children, a couple sons-in-law, 9 grandchildren, a few dogs and significant others, and most recently a great-grandbaby to enjoy. It is a giant slumber party, with football at the local elementary school fields, and long walks and talks, football on TV, jigsaw puzzles in the living room. And of course, my mom’s cooking. I love it. But this year is different. We aren’t having our normal, crazy family Thanksgiving at my parents’ house. My sister will be with her family. Only two of my four children can come this year. My parents are staying at their house with my brother and his family. It will be quiet, less stressful for sure — different. My mom says that change has to happen, that it is the normal way of things. But to be fair, I don’t like any change anyway. I’m quite change-averse. I set out on my path, like Balaam in the Bible story, and I get very frustrated when something makes me change my plans. I have spent the last few weeks being upset that Thanksgiving is different this year. But as the day arrived, I realize how much good is in this change. I was relaxed with no long drive to mom’s house, no packing of the dogs, making sure Sugar got her car-sick medicine an hour before we left. As much as I love my mom’s house and her wonderful kitchen and greenhouse to just sit in, it was nice to enjoy extended time in my own home. It was fun to watch Taylor setting out her pre-dinner snacks and to get out serving dishes that are rarely used. We were able to include a friend who didn’t have any place to go, and Taylor’s boyfriend was able to work and enjoy family Thanksgiving. And I got to watch Moana for the first time, while lying on my favorite Lazy-Boy chair under a cozy blanket. I still don’t like change, but I’m trying to embrace it. Change can be good. I have always been extremely cautious, not at all inclined to take risks. I have usually been able to learn from mistakes and misfortunes of others. If someone else has had a problem with something, I tend to shy away from it. This proclivity toward cautiousness was the reason I have never tried any illegal drugs, I have never been drunk to the point of illness and I have gotten only one traffic ticket in almost 40 years of driving. I watched other people’s pain and embarrassment, and I avoided following in their footsteps. But being cautious also means I have missed out on many opportunities that may have been wonderful. I don’t take risks in general. If someone, sometime, had any sort of problem, I tended to avoid similar problems. I avoided “difficult” courses in college. I gave up a job that was probably really interesting because it did not guarantee a certain income (though I was good at it and probably would have been well paid) and other people had financial difficulties. And, more importantly, being so cautious has always meant that I avoid any situation that might present a risk to myself. The recent reports of women and men who were sexually abused by powerful people — and random strangers — has me thinking about how many situations, jobs, and experiences I have avoided because of the risk of being sexually abused. The lesson I learned about sexual abuse as I was growing up was that it was going to happen unless I stayed away from certain situations, and dressed in a very certain way. That was just the way it was. What I never learned was how to stand up for myself, and say STOP. I never learned how to protect myself, beyond avoidance. If this was driving cars, I would have learned to avoid all traffic accidents by never driving a car — effective to be sure, but terribly limiting behavior. I was raised to be a southern lady. The worst thing a southern lady can do is to break the social norms — to be rude. Confrontation is often taken as rude behavior, so I was never taught how to confront people. I was taught to smile and ignore poor behavior, then to talk about the behavior with a third party with the understanding that the message would eventually get back to the person behaving badly, in a round-about, passive-aggressive manner. When I was in high school, my favorite activity was drama. I loved being on stage. Being an actor seemed like a dream occupation. I participated in every school play I could, and sought out voice and acting classes outside of school. But my dreams died the day my mom explained the “casting couch.” She told me I would never make it as an actor if I was unwilling to sleep my way into roles. As I saw it, if I was unwilling to participate in these “extra activities” and failed to reach my goal to be a professional actor, I would never know if it was because I wasn’t good enough. To fail and to know I just wasn’t good enough would be hard enough. But to fail and never know what could have been would never had been acceptable. So I gave up that dream, and never went back on stage. In college, I was really good in calculus. I worked hard, but kept an A average. I knew I was good in math when I picked up a friend’s statistics textbook (a class I hadn’t taken) and was able to understand the chapter and explain it to her. But just as I was about to consider a major in math, I picked up a science fiction novel my professor had written. It was sexually graphic and disgusting. I could no longer look that man in the eyes, much less go to that man’s office to seek advice on math careers. I had heard of other students being sexually molested by professors, and had been warned about being in a closed room with men all of my life, so I avoided another potentially dangerous situation. Sexual abuse does not just affect people overtly. It has a ripple effect throughout society. Because some women have been abused, other women have taken themselves out of many situations completely. The overt act shames and diminishes the woman who experiences it. But the ripple effect diminishes many other women who are watching. Women have been diminished enough. It is time to call out every abusive act, from the small to the large. No one should be diminished by another person’s crude joke, misplaced touch, or innuendo. It is not ok and should not be tolerated for another minute. Last July, I wrote a narrative about jumping off the diving board. It was a true story. It really did take me years to work my way off that high dive. But I also meant my story to be symbolic of jumping into scary things, of getting started without knowing how it would end. I purposely didn’t end the story, but left the reader hanging, not knowing — but assuming — that all ended well, that I was able to survive my jump and safely swim to the edge of the pool. I think I really wanted to convince myself that jumping into scary things would end up ok.
My goal was to start this blog — ironically named “Just Jump In”. I started it alright. I even paid money for an upgraded blog package because I was really going to start writing now. I think I managed two whole posts all summer. I found myself back on the symbolic high dive, wanting desperately to add to my writing, but unable to make that jump. I even wrote in my introduction to the parents of my 5th grade students that I write something every day (actually true IF you count writing lesson plans and completing endless paperwork). Last month, I read the book The Subtle Art of Not Giving A F*ck by Mark Manson. Then I subscribed to his blog (markmanson.net), where he promised access to a class on writing, and has a post about starting a blog which is only available to subscribers. (I love his book AND his blog, BTW.) One thing I learned from his post is that to become a writer, you have to actually write. Not news, since literally every book I have ever read about becoming a writer says the EXACT same thing. But Mark says something more quantifiable — he said that you need to write hundreds of thousands of words, and over 100 pages on a single topic before you even know what you want to write about — before you ever find your voice. So, imaginary reader, this blog will probably take the form of a Seinfeld episode for a while — a blog about nothing specific. My goal is to write, to find my voice. I hope someone joins me for the ride. 385 words down, 999,615 words to go. Dedicated to my two favorite drum corp kids. A quick hug and kiss goodbye, and you are off again, never staying home for more than a day or two. I search endlessly for pictures on Instagram, Facebook, and Twitter, just to see your face for a moment, to know you are happy, or worry that you are not. I wake up in the middle of the night, just to check scores from competitions on the other side of the country. If they know drum corp, they understand. If they don’t, they’ll never understand. But I don’t think anyone really understands, except for other Drum Corp moms. I am a Drum Corp Mom. I am happy if I get a quick hug in the lot as you warm up. I want everyone to see my love and pride for all that you are doing. I sit in the stands to watch you practice, smiling at your talent and dedication. Then you walk off the field, only to do it all again tomorrow, in a different city, in a different state. I am continually amazed that 150 people can work together to make something so amazing. I cry tears of joy and pride at all you have done. Then I watch the young fans come to you, asking for selfies and autographs. You are kind and generous with these young strangers, always taking time to talk with them and encourage them. It is these hours spent alone that make you. I know that this is your bliss. I will always be a Drum Corp Mom. Last week I tried to describe Mount Rainier to a friend based on facts that I knew. My husband’s family has lived in the Seattle area for decades. They have told me about the mountain, and I’ve seen pictures. But I had never been to Seattle myself, so I had never actually seen it. I had heard that it was large, but I’ve been to the Alps, the Tetons, and the Rocky Mountains–I’ve seen tall mountains. In the back of my head, I really thought everyone was exaggerating just a little bit. I was sure it was big, and beautiful–but so are lots of other mountains. Mount Rainier is so much more massive than anything I have seen. At 14,409 feet, it is the most prominent peak in the lower 48 states. I could see it from just about everywhere I went. It wasn’t like in North Carolina where you can see the distant mountains as blue bumps on the horizon. I could see the snow topped cone of the dormant volcano from 100 miles away, looming over the horizon. We spent a day in the Mt. Rainier National Park. 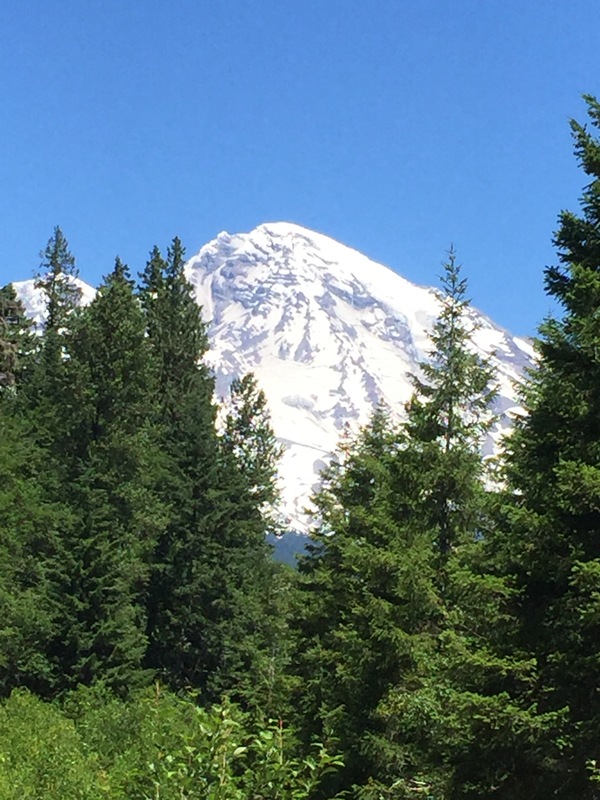 We threw snowballs in July–well, I threw snowballs–and we hiked a few miles into a mountain meadow area about a third of the way up the mountain. The heavy snows from last winter were still covering many parts of the paved trails. We took picture after picture because the beauty of the area is beyond words. Being able to learn from books and videos is wonderful. The internet can take you to places you can’t access and can connect us to the world. But it doesn’t compare to getting out in the world and experiencing it for yourself. You have to just jump in.